The aim of the present study was to assess the awareness about travel-related health problems among Umra and Haj travelers in Menoufia Governorate, Egypt. Several surveys have demonstrated that high proportions of travelers are unaware about travel-related health problems. These problems vary in significance, from relatively minor to life threatening conditions, including infectious and noninfectious diseases. This cross-sectional, descriptive study was carried out in the Shebin El-Kom District, Menoufia Governorate, during the period from 1 April 2013 till the end of October 2016. A predesigned questionnaire was used that included questions related to the participants' socioeconomic status, travel circumstances, and travel knowledge, attitude, and practices. The study included 400 participants – 16.2% males and 83.3% females. Their mean age was 45.96 ± 14.16 years. About two-thirds had no knowledge regarding common infectious diseases (60%) and mode of disease transmission (62.5%). Most of the participants had no knowledge about the importance of vaccination (76.2%), and also, most of the participants had a positive attitude toward different items related to travel as they agreed regarding practice. In addition, more than half of the participants had never sought any advice before travel, and only 10% reported starting preparation 2 weeks before travel. The review demonstrated an inadequate level of travelers' knowledge, poor utilization of travel medicine services, and poor practising of seeking pretravel health advice, thus indicating a low knowledge, attitude, and practices among the studied participants. This highlights the need for an increase in the awareness about travel-related health problems among Haj and Umra travelers. Health safety during travel is based on previous counseling, vaccination, and prevention of infections, and previous diseases' experience of specific problems related to the destination (region or country) . Travelers may be exposed to several health problems or infections at the destination or during travel . Traveling for short periods has become a common activity in the last 50 years, especially with air travel becoming available to most people . Most people traveling to the old world consider health problems as being either punctual or occasional, with low awareness or expectation regarding travel-related health problems . A significant number of travels are made without prior counseling or health insurance. There is an increasing number of travelers, both for leisure and also for business, without increasing information or awareness regarding travel-related health problems . Travelers play a significant role in the spread of infectious diseases across international borders through their travel patterns and behaviors . A pretravel consultation with a health professional can provide the traveler with the necessary preventive advice on minimizing health risks during travel, including the risk for infectious diseases, and the opportunity for relevant vaccination and chemoprophylaxis . Mortality studies indicate that the cardiovascular diseases account for the most deaths during travel (50–70%), followed by injuries and accidents (25%). Infectious diseases account for about 2.8–4% of deaths during/from travel. Morbidity studies suggest that about half of the people from developed countries who stay for at least 1 month in a developing country will fall sick. Traveler's diarrhea was reported to be the most common problem encountered . Travelers for the Umra and Haj registered only in the local health facility in Egypt. Therefore, the study was conducted in the Shebin El-Kom Family Health Center, Menoufia Governorate, which is the only site for providing healthcare services for all Umra and Haj travelers in Menoufia Governorate. This cross-sectional, descriptive study included 400 participants aged more than 18 years seeking pretravel (for the Umra and Haj) vaccination at the Shebin El-Kom Family Health Center, which is the only site for providing healthcare services for all Umra and Haj travelers in the Menoufia Governorate, Egypt. The study was conducted during the period from 1 April 2013 till the end of October 2016, and was approved by the Ethical Committee of the Faculty of Medicine, Menoufia University. All participants were asked to fill a predesigned questionnaire regarding their knowledge, attitude, and practices (KAP) toward travel-related health problems. The total target population was the attendance rate in 1 year from April 2012 to April 2013 seeking pretravel vaccination, which was 18 777 persons, and the power of the study was 80%, calculated using version 7, with a confidence level of 95%. The sample size was 376 and it was increased to 400 to round off the figure and to overcome the expected dropout. All the attendants to the Shebin El-Kom family health center seeking pretravel vaccination until fulfillment of the sample size were included in the study. All the uncooperative participants (10 participants) were excluded. All attendants were interviewed from 10:00 a.m. to 2:00 p.m. on 2 working days per week during the period from 1 June 2013 till the end of February 2014 and were invited to participate in the study until fulfillment of the sample size. The questionnaire included three sections. The first section was for basic evaluation of the participants: it included personal data such as name, age, residence and address, and socioeconomic status using five parameters (occupation, education, family size, family income, and overcrowdedness) as proposed by Ibrahim and Abd El-Ghaffar . The second section consisted of questions regarding travel destination, duration, and preparation. The third section of the questionnaire consisted of questions to assess the participant's KAP regarding travel-related health issues – nine questions about knowledge, five questions about attitude, and six questions about practice. All participants signed an informed consent once the research objectives and procedures were explained to them. Data were collected, tabulated, and analyzed by using a personal computer with statistical package for the social sciences, program version 16 (SPSS Inc, Chicago, Illinois, USA). Data were expressed as percentages. [Table 1] shows that the mean age of the studied participants was 54.96 ± 14.16 years. Overall, 16.2% were males and 83.8% were females; 71.8% were from middle socioeconomic level, 16.5% were from low socioeconomic level, and 11.8%, the lowest percentage, from high socioeconomic level. 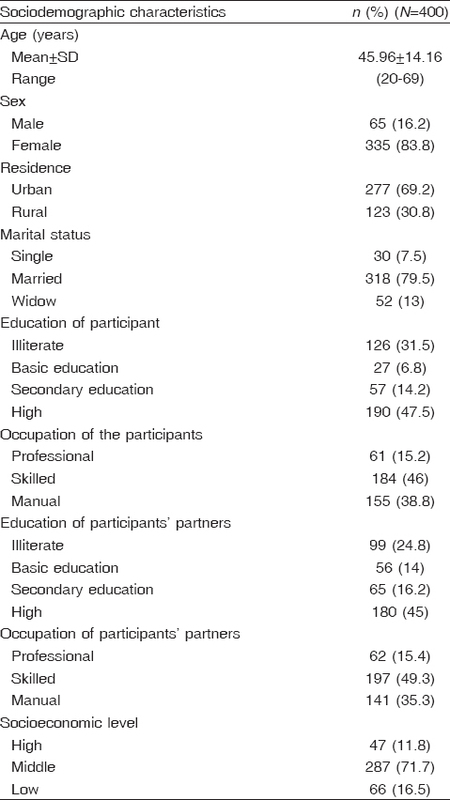 [Table 2] shows that more than half of the participants (58.2%) knew about travel-related health issues from relatives and friends; two-thirds had no knowledge about common diseases prevalent in the destination, the mode of disease transmission, and protective measures (60, 62.5, and 63.2%, respectively). Most of the participants had no knowledge about the importance of vaccination before travel, special precautions to be taken when traveling with children and newborns, protective measures against fly bites, and contraindication to vaccination (76.2, 77, 77.8, and 85.7%, respectively). [Table 3] shows that most of participants had a positive attitude toward different items related to travel as they agreed on the importance of visiting a family physician before travel (91.8%), travel-related health hazards (95.5%), the importance of vaccination (97.5%), the risk for infection posed by the intake of raw foods and drinks (96.3%), and the adverse effects of chronic diseases on travel (97.8%). [Table 4] showed that 62.5% of the participants never took any medication during travel and 57.5% of them never sought any advice before travel; furthermore, 75% of them never practised the recommended advice, 85% of them never cared for food, drink, and the living place, 90% of them did not prepare for travel 2 weeks before, but 87.5% of them took vaccine. This cross-sectional, descriptive study included 400 participants with a mean age of 45.96 ± 14.16 years – 16.2% participants were males and 83.8% were females. As regards the source of knowledge [Table 2], more than half of the participants (58.2%) knew about travel-related health issues from relatives and friends, followed by family physician (24.8%), which is in agreement with a study conducted on Japanese travelers who sought travel health information from travel medicine specialists (25%) . On the other hand, a study conducted on travelers departing from Sydney and Bangkok airports showed that the major sources of knowledge were from health professionals (79.5%) . 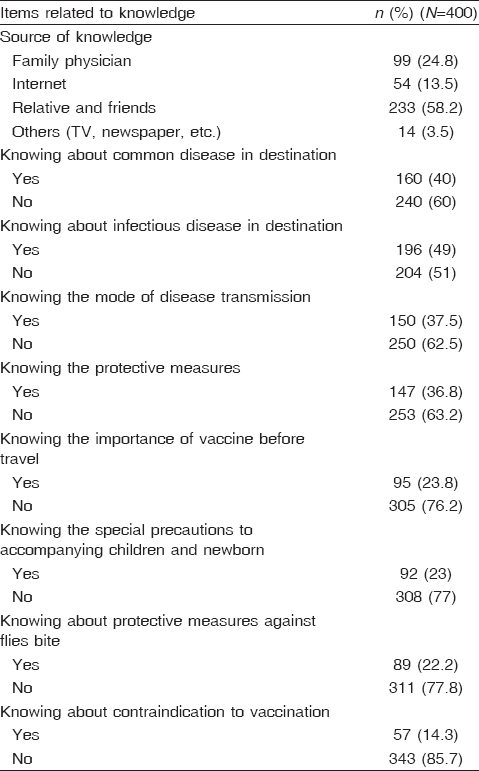 In the present study, only 33.8% of the participants were aware about the importance of vaccination before travel, as shown in [Table 2]. On the other hand, in Dubai about 96.2% travelers know about the importance of vaccination before traveling . Moreover, about 76% of Australian travelers believed that vaccination provides the essential protection . 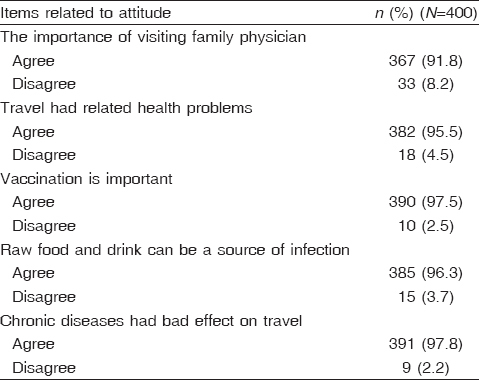 Concerning attitude [Table 3] in the present study, ∼95.5% of the participants had a positive attitude toward perception of travel-related health problems; this was in agreement with a study conducted in Saudi Arabia that revealed that half of participants had uncertain attitude regarding perception of risk for diseases related to travel . As regards attitude [Table 3] toward the importance of vaccination in the present study, 97.5% of the participants had a positive attitude, whereas a study in Dubai revealed that 55.6% of participants perceived the importance of vaccination . 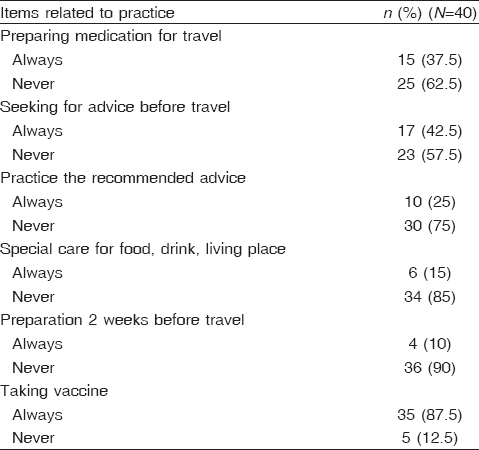 As for practices [Table 4] of the studied group, 42.5% of the participants seek health advice before traveling, but only 25% of them usually practise the recommended advice. In contrast, a study conducted in Dubai showed that only 22.8% of travelers sought travel health advice from a travel clinic before departure . Another study in Sydney and Bangkok airports reported a low uptake of pretravel health advice and vaccination among participants . Our study [Table 4] revealed that only 10% of the participants started preparation 2 weeks before travel. On the other hand, another study reported that among Spanish travelers the mean time for preparing for the trip was 39 days . There was inadequate level of travelers' knowledge and poor utilization of travel medicine services as well as poor practising of seeking pretravel health advice, indicating a low KAP among the studied participants. This highlights the need for increasing the awareness concerning travel-related health problems among Haj and Umra travelers. We should increase the uptake of pretravel medical advice, ensure that vaccines, both routine and those recommended for travel, are up to date, and also provide clear information about the potential health risks associated with travel. In addition, there is a great need to establish a specialized travel medicine service with a wider scope at the national level. Development of recording systems for all travelers in the governorate should also be taken up. Matos V, Barcellos C. Relacoes entre tursimo e saude: abordagens metalo logicus e propostas de cao. Rev Panam Salud Publica 2010; 28:128–134. Gavish I, Brenner B. Air travel and the risk of thromboembolism. Intern Emerg Med 2011; 6:113–116. Silverman D, Dendream M. Medical issues associated with commercial flights. Lancet 2009; 373:2067–2077. Cavalcanti A, Clemens SA, Von Sonnenburg F, Collard F, De Clercq N, Stefen R. Traveler's diarrhea: epidemiology and impact on visitors to Fortaleza. Rev Panama Salud Publica 2002; 11:245–252. Piotte E, Bellanger AP, Piton G, Millon L, Marguet P. Pre-travel consultation: evaluation of primary care physician practice in the Franche-Comte region. J Travel Med 2013; 20:221–227. Dahlgren AL, DeRoo L, Steffen R. Prevention of travel-related infectious diseases: knowledge, practices and attitudes of Swedish travellers. Scand J Infect Dis 2006; 38:1074–1080. Heywood AE, Watkins RE, Iamsirithaworn S, Nilvarangkul K, MacIntyre CR. A cross-sectional study of pre-travel health-seeking practices among travelers departing Sydney and Bangkok airports. BMC Public Health 2012; 12:321.
WHO. Health risks and pre cautions: general consideration-contents of basic medical kits. Available at: http://www.who.int/ith/ITH2010. [Accessed June 2014]. Ibrahim M, Abdel-Ghaffar A. Estimation of the social and economic state of the family. Ain Shams Univ J Appl Psychol 1990;14:125-41. Omer F, Hamid Hussain NH, Sami M, Omer A. Travel health, gaps in knowledge, attitudes, and practices among Dubai travellers, Dubai, UAE. Int J Prev Med Res 2015; 1:126–131. Wilder-Smith A, Khairullah NS, Song JH, Chen CY, Torresi J. Travel health knowledge, attitudes and practices among Australasian travelers. J Travel Med 2004; 11:9–15. Alghamdi0F AH, Ibrahim AM, Al-Ghamdi2F MS, Ryan3F ET, Al-Raddadi R. Travel health in the Kingdom of Saudi Arabia: Perception and practice of Saudi travelers. Int J Health Res Inno 2014; 2:25–39. Lopez-Velez R, Bayas JM. Spanish travelers to high-risk areas in the tropics: airport survey of travel health knowledge, attitudes, and practices in vaccination and malaria prevention. J Travel Med 2007; 14:297–305.